In 2 weeks my husband and I will be moving into our new home (away from home). We're still keeping our house in Arizona, but we'll be calling this lovely apartment home until his contract with the Air Force is finished. I'm excited about being able to take this space and turn it into something that works for us. It's a 955 sq ft 1bd/1ba + loft. I'm thrilled to have 20 ft ceilings in the living area and 2 stories of windows :) but I'm still trying to figure out furniture placement. I'm obsessed with interior design and know many of you out there have design talent. Any suggestions would be greatly appreciated. 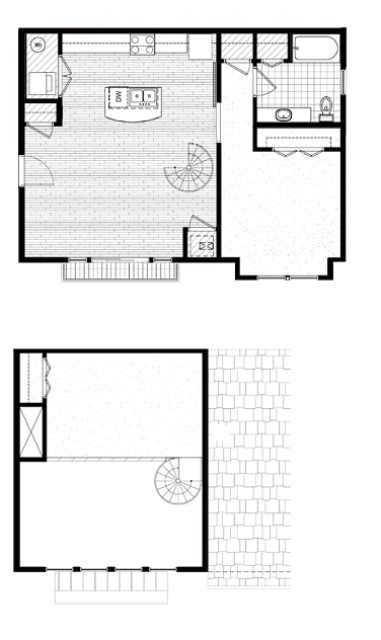 The living room is 14'6" x 19'13" (window to kitchen island) and features a spiral staircase to the 2nd floor loft. The bedroom is 12'9" x 12"3". I'm not thrilled with the lack of closet space, but this is an apartment so you can't get it all. IKEA is going to be my new best friend as we try to furnish this place on a budget... but I do have hopes of painting some walls, adding art and documenting all progress for my blog.